18 Mile: Just when I think I'm out. They pull me back in. I thought today would be be the end of the season. The day I would go out, catch only bass and put a period on this long but extremely gratifying season. But no, no, no! 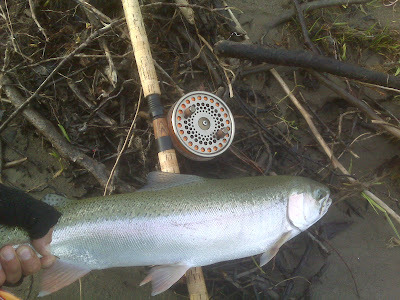 There were a few steelhead to be had. Also thrown in were about 30 bass and two specimens of North America's most elusive species, the freshwater drum. The Bass were banging jigs in various colors so I switched over to the magical pink worm on a 1/32 ounce jig head and BINGO. 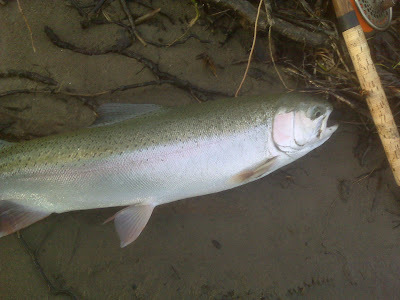 The Steelhead were a mix of dropbacks and chromer jacks. The dropbacks were leapers and they were fun while the jacks were a little spunky too. During the day I ran into Bill Shearer and his ace fishing partner Frank. They were on a mission and had various spots to hit during the day. I also ran into Willie. Willie is a fixture on one of Chautauqua County's more famous streams but today he was sharing a run with me on the Catt. He was a very nice guy as was his partner who constantly busted his balls was a laugh. There seems to be a pattern here in the fishing world with the treatment of partners ha ha ha ha . 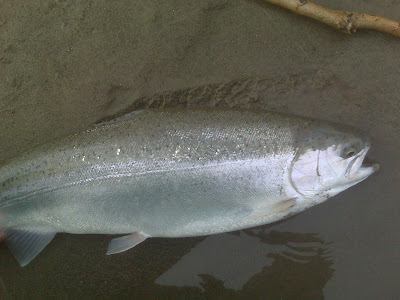 Both Willie and his partner got into some steelhead too and a ton of bass. On a final note check out River Monsters on the Animal Planet channel. My friends and I love the show. There are also a bunch of clips on You Tube.